Damon Albarn's Gorillaz is the world's biggest bedroom-pop project, the hermetic musings of a man with enough clout to call up Grace Jones like he's ordering a pizza. The Now Now is a tacit admission of this, an album of hunched-over experiments in soft-spoken jazz-funk with little promotional hullabaloo and only a handful of guests. At 11 songs and 40 minutes, it's the shortest Gorillaz album and the lowest-stakes since 2011's sad iPad odyssey The Fall, with which it shares a fascination for the mythology of the middle American road journey. 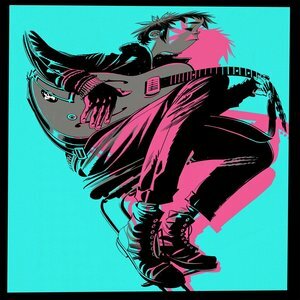 If you didn't like last year's Humanz for its glut of guests and lack of emphasis on Albarn's sandy, pinched warble, this is as close to a one-on-one experience with the erstwhile Blur singer as you're ever going to get—apt, as this is meant as a solo album by the cartoon band's "frontman" and Albarn avatar 2D. The Now Now doesn't sound particularly cartoonish. While Gorillaz' music always had a ligne-claire complexity that gave it the illusion of springing off the page of a comic, the music here is more VHS than Saturday morning. It fits neatly within the post-Odd Future school of L.A.-style pop that spins summery nostalgia into something druggy and slightly unwholesome; think Steve Lacy, Kali Uchis, Rex Orange County, or Tyler, the Creator's Flower Boy. It has almost nothing to do with the post-everything future-pop of Demon Days and Plastic Beach, and it reminds us that while Gorillaz once sounded like the future during that mid-'00s era when the Internet threatened to destroy the boundaries between pop and rap and rock, the project's influence is most palpable now in songs like Uchis' "In My Dreams", progeny of droopy-eyed Albarn ballads like "On Melancholy Hill". The Now Now was largely conceived on the road. It flits from place to place with the noncommittal wanderlust of a rock star who travels the world but is only allowed to see a little bit of it at a time, between the hotel room and the venue. The Albarn—or 2D—of this album seems to drift through it all, and there are a few worrying drug references that give a possible explanation why Albarn's seemed so absent from the project lately. "Tranz" seems to be about getting high, and he surely knows what people will think of when he sings "my face will be painted in these white brick lines" on "Fire Flies" ("chasing fireflies", in this song's context, reminds me a lot of "chasing the dragon".) Gorillaz' music is frequently very sad, but while Plastic Beach looked wistfully on a dying world and songs like "El Mañana" live in fantasy, The Now Now rises from a more personal place of ennui. That it's personal rather than political is one of its strengths. Albarn has always been woeful at writing about politics; this is a man with an album called Democrazy to his name. This is why Humanz, for all its overstuffed anonymity, succeeded in areas Demon Days and Plastic Beach didn't; he let queer musicians and musicians of color handle the topical ickiness, avoiding the messianic tendencies of the rich white rock star. There are a few gestures here towards the wrongs Albarn sees in the world ("there's a billboard on the moon," he sings on "Magic City"). But a more typical line is the one that comes right before it: "I filled the canyon with my ego." Is it possible Albarn sees Gorillaz as an oversized King Kong he wrought on the world? Surely Humanz would have been much more warmly received if not for all the star-sized baggage attached to the Gorillaz name. On "Lake Zurich", a sickly disco jam that shimmers like spilled oil on the roadway, Albarn vaguely describes an idea to "build a tunnel from Zürich to New York". It's a quixotic quest with echoes of Elon Musk, and at first it seems in line with Albarn's fascination with environmental degradation. But the lines that come next should be familiar to any artist. "I find it hard to share this with anyone / Because even to me it sounded ridiculous / But after a long complicated night / I made up my mind to share my vision with the world." Is he talking about Humanz? Is the retreat into road-warrior hermeticism his response to the overwhelming size and bloat of the Gorillaz project? It might seem churlish to wax on the future of a band that's given us two albums in two years, but it's hard not to see The Now Now as Albarn's way of killing the beast, a plane hovering around the Empire State.